The second ancestor in my 52 Ancestors project this year is my maternal great-great-grandfather, Carl Friedrich Herman LAST, also known as Charles. I’m related to Charles via my mother → her father (LeRoy THIELKE) → his mother (Madora LAST) → her father (Carl LAST). From the information we have, Charles was born in the small town of Döringshagen, Naugard, Pommern, Germany on 26 September 1851. This area is now known as Wołowiec, Zachodniopomorskie, Poland. He was the second child, and first son, of Johann & Charlotte (STRASSMAN) LAST. 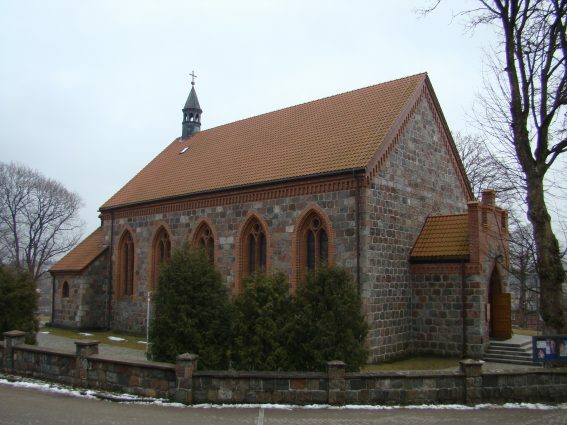 Even though I’ve found the baptism and marriage records for both of his parents, I have yet to find his baptismal record in the Germany/Prussia/Pomerania church records available online. When Charles was 5 years old, his family left Germany and traveled to the United States from Hamburg to New York, arriving on 14 September 1857. From there they made there way to southeastern Wisconsin, settling in the town of Grafton in Ozaukee County. 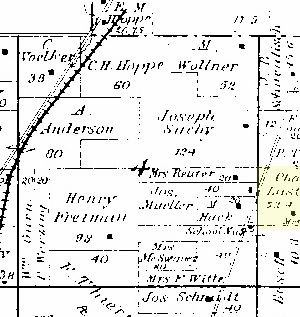 Plat Map of Grafton, Wisconsin, 1892 – Charles Last land is yellow box at right. Charles and his family lived in the Grafton area from 1860 through the 1880 census records. On February 25, 1883, Charles marries another German girl, Augusta LUEDTKE in Milwaukee, Wisconsin. I have yet to figure out why they were married 25 miles south in Milwaukee. It is possible that Charles was temporarily living there. I think Augusta lived there at the time, but I have no proof of that as she immigrated in 1881, just after the census record. I think Charles and his family ended up taking over his parent’s farm as it seems they were in the same area in the 1900, 1910 and 1920 census records. On June 5, 1926, Charles passed away at the age of 74, of what they labeled as “Apoplexy.” Today, they would probably call that a stroke. It is said to have been caused partly by senile dementia. He is buried nearby at Union Cemetery in Port Washington, Wisconsin. I do actually have some info on the DNA I possibly received from Carl and his wife. 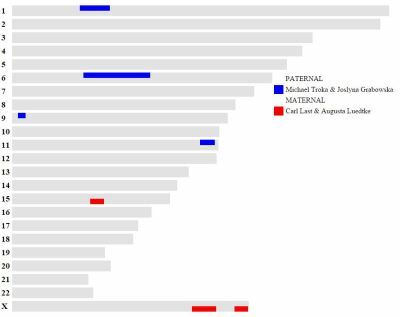 I have a DNA match that is related to me through Carl and his wife Augusta, through one of their daughters (my great-grandmother’s sister.) I actually received a few photos of Carl and his family from them. There are a few other matches that overlap this area, but I have yet to confirm anything with them. After getting my DNA tests completed and for the past few years pouring over that data using tools like GEDMatch, and most recently, Genome Mate, I’ve started to accumulate Most Recent Common Ancestors (MRCA) with some of my DNA matches. How to figure those out is another post entirely. Granted, I don’t have a lot of confirmed MRCAs, yet, but I do have a few. You can use this data to make a chromosome mapping. Genome Mate does this for you in the software, but there is also a web version (seen below) that will do it for you. This will paint all of the segments on your chromosome that match those ancestors. Once you get a lot of confirmed MRCAs, the mapping looks really cool. Mine is getting started. Click for full version. Do your own here. As you can see, I only have 2 MRCAs confirmed, one on each side. 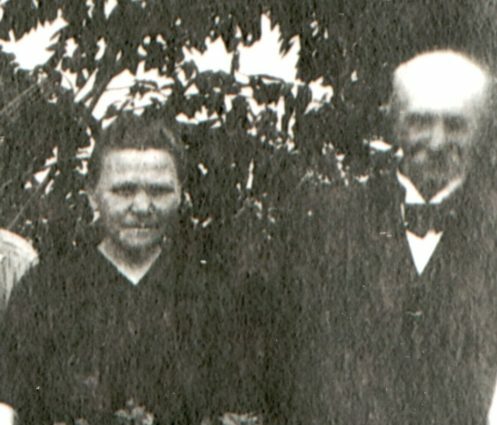 My paternal 3rd-great-grandparents, Michael Troka and Josylna Grabowska and my maternal great-great-grandparents, Carl Last & Augusta Luedtke. The Troka connection is not yet fully confirmed, but the information we have is pretty solid. The Last connection is confirmed as I’ve matched up family trees with a 3rd cousin I found via a 23andMe match. I have a few more matches in progress that are close to finding information on our MRCA. It can be tough work sometimes, but there is hope of finding all new ancestors. UPDATE: There is an update posted on this mystery photo. 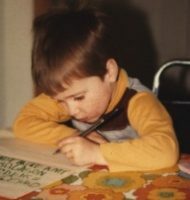 We’ve been doing a bit of cleaning at my grandparent’s house recently, which has caused us to come across a lot of new family photos from my maternal side. This comes as a double-edged sword as there are some amazing old photos, including a very old photo album filled with late 19th-century, early 20th-century photos, but most of them are not labeled. I hope to spend some time with my grandfather and run a few of them by him, but he may not remember anymore. There was one neat, large family photo that we found. I had no idea who it was. Then, I noticed a few things on the mother in the photo. She looked strikingly similar to my great-great-grandmother, August (Luedtke) LAST. Though, I only have more recent photos of Augusta and she lived to be 100, so her age changed her appearance quite a lot (as it does to us all.) But, there were certain things about her face in both photos that matched up quite well. Here is a quick comparison image I put together. One of the few things I noticed was her mouth, how both of them are very straight across. Then, I noticed the nose. Both have a bit of a ball on the tip. The last thing I noticed were the ears. Augusta seemed to have ears that landed in the “larger” category and both women also have these. It’s tough to match the eyes as her age has caused some problems around that area, but they do look similar. Her forehead and hairline match up quite well. The only lingering issue is when I look through the list of children I have and try to match them up with the children in the photo. They don’t line up quite right. Here is the complete family photo with the children listed below. I’ve tagged the children from oldest to youngest based only on how old they look in the photo. Click for larger version. Family Group Sheet for reference. The couple’s first child was John, born in 1885, whom is probably child #2. Their second child was Emma, born in 1886/1887 whom is probably child #1. Their third child was William, born in 1888, probably child #4. This is where it goes off the rails. Their next children were Ida and Helena, twins born in 1889. I don’t see any twins in the photo and their both recorded as having lived until at least 1969. The next child of that age range would be child #3. The next child would be August, born in 1891, whom may be child #5. The next 3 children either died not long after birth or at a date unknown, Bertha, Charles, and Freida (1893, 1894, 1897) so I assume they’re not in the photo based on this info. That would make child #6, Madora, my great-grandmother, born in 1898. Though, she always had dark hair, but I know hair can change as kids grow, so who knows. #7 and #8 don’t really even line up unless we can work out the previous issues. I guess the moral of the story is to label your photos. I’ll keep you updated on anything more I figure out. I’ve already sent the photo to some descendants of Helena that I connected to via 23andMe to see if they notice any similarities. This only the second photo I have of my great-great-grandmother, Augusta (LUEDTKE) LAST. She lived to be 100-years-old, passing away after 1 century and 2 weeks. She looks tough, and she should, she also had at least 16 children. 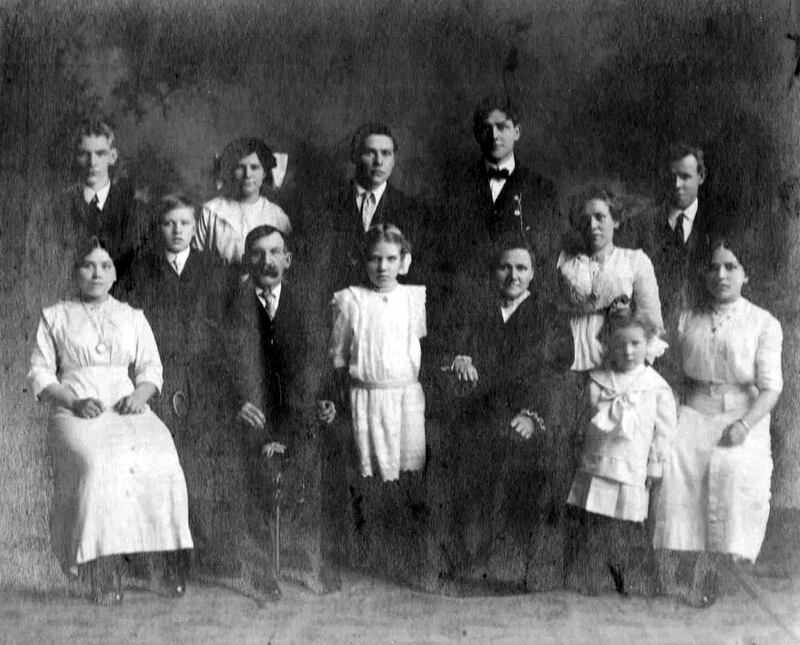 Minnie (Muhm) Van Price, 3rd from left. I seemed the have missed last week’s post, probably due to July 4th throwing everything off. 1811 – Died – Philemon SUTHERLAND – Philemon is my wife’s 7th-great-grandfather on her father’s side. He was born about 1718 in Prince Edward Co., Virginia. He married Mildred ARCHER. He passed away in Franklin Co., Virginia. 1849 – Died- Francois Eugene LOOD – Francois is my 4th-great-grandfather on my mother’s side. He was born on 6 Nov 1786 in Piétrebais, Walloon Brabant, Belgium. In 1812, he married Marie Catherien DUPONT. He passed away in Piétrebais, Walloon Brabant, Belgium. 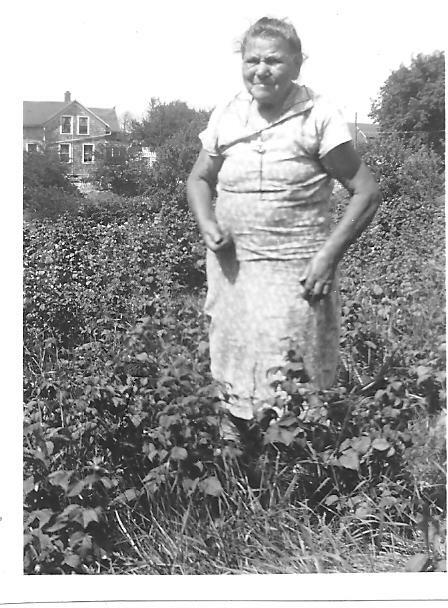 1879 – Born – Minnie M MUHM – Minnie is my great-great-grandmother on my mother’s side. She was born in Norwood Township, Langlade Co., Wisconsin to Peter & Ida MUHM. She married Pieter Franciscus VAN PARIJS (Peter VAN PRICE) in 1895 and had 6 children. She passed away on 6 Jul 1959 in Port Washington, Ozaukee Co., Wisconsin and is buried there at Union Cemetery. 1876 – Died – William CORRIGAN – William, known as Curly Bill, is my 3rd-great-grandfather on my father’s side. He was born in about 1823 on either the voyage to America or somewhere in New York State. He married Mary MCCANN in 1848 and had 12 children, including my ancestor Thomas J CORRIGAN. He passed away at Mara Township, Brechin, Ontario, Canada. 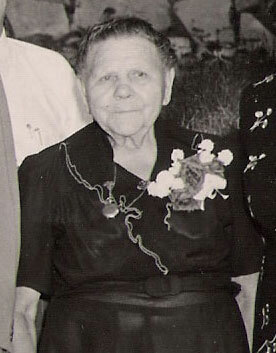 1963 – Died – Augusta Johanna LUEDTKE – Augusta is my great-great-grandmother on my mother’s side. She was born 3 Jul 1863 in Storkow, Pommerania. She married Carl F H LAST in 1883 and had 16 children. She passed away 2 weeks after her 100th birthday in Grafton, Ozaukee Co., Wisconsin and is buried in Port Washington at Union Cemetery. 1810 – Born – Ephraim Gadious dit ST. LOUIS – Ephraim is my 4th-great-grandfather on my mother’s side. He was born in Yamachiche, St. Maurice, Quebec, Canada. He married Marie DesAnges MANSEAU in 1831 and later settled in Wisconsin. He passed away on 27 Mar 1891 in Phlox, Langlade Co., Wisconsin. I missed the Way Back Wednesday this week, oops. Anyway, here is the weekly history for this week. As always, you can find this on the Dates & Anniversaries page. 2005 – Died – Edwin Bernard CORRIGAN – Edwin is my great-granduncle on my father’s side. He was the last surviving child of Thomas & Emma Jane CORRIGAN. I met him many times at a few of the family reunions. He was a very nice man and was very interested in genealogy, which was good for that side of the family. I transcribed a few of his letters in the past and put them on my site. He was born 4 Oct 1909 in Ashland, Ashland Co., Wisconsin. He married Esther Mae EIDE and has one child. He passed away in L’Anse, Baraga Co., Michigan at the age of 95. 1725 – Died – Louis QUINET – Louis is my 9th-great-grandfather on my father’s side. He was born about 1635 in France. He married Marguerite BROSSIER and had 4 children including my ancestor, Georges QUINET. He passed away at Contréglise, Haute-Saône, France. 1664 – Born – Ernest Ludwig FABER – Ernest is my wife’s 8th-great-grandfather on her father’s side. He was born at Neipperg, Baden, Germany. In 1691, he married Maria Catherina STOLTZENHABER and had 4 children. He passed away on 10 Mar 1739 at Neipperg, Baden, Germany. 1941 – Married – Keith R MORAN and Barbara COLLINS – Keith and Barbara are my wife’s grandparents. 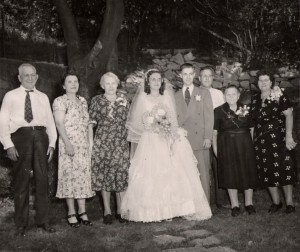 They were married at the Little Brown Church in Nashua, Iowa. Together they had two boys. Keith passed away in 1985. 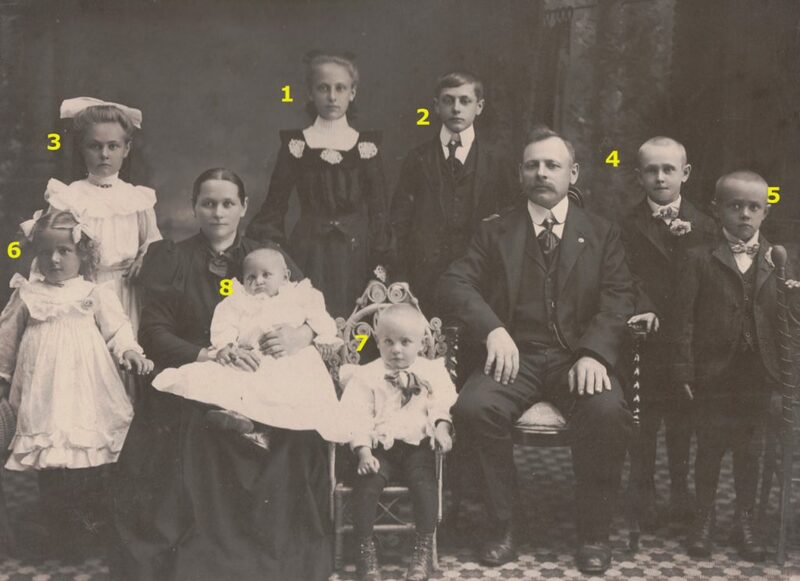 1863 – Born – Augusta Johanna LUEDTKE – Augusta is my 3rd-great-grandmother on my mother’s side. She was born in Storkow, Pommerania which is now just east of Szczecin, Poland. She immigrated to the US at an early age and married Carl F H LAST in 1883. Together they had a whopping 16 children. Carl passed away in 1926 and Augusta lived to be 100, passing away 2 weeks after her 100th birthday on 14 Jul 1963. 1890 – Died – William Henry THOMPSON – William is my 4th-great-grandfather on my father’s side. Unfortunately, I’m not exactly sure where and when he was born. The census and other records span from 1810 to 1816 and mention England, Ireland, and Scotland. He married Francis QUINET in 1839 and had 10 children. He passed away in Wrightstown, Brown Co., Wisconsin and is buried there at St. Paul’s Cemetery. 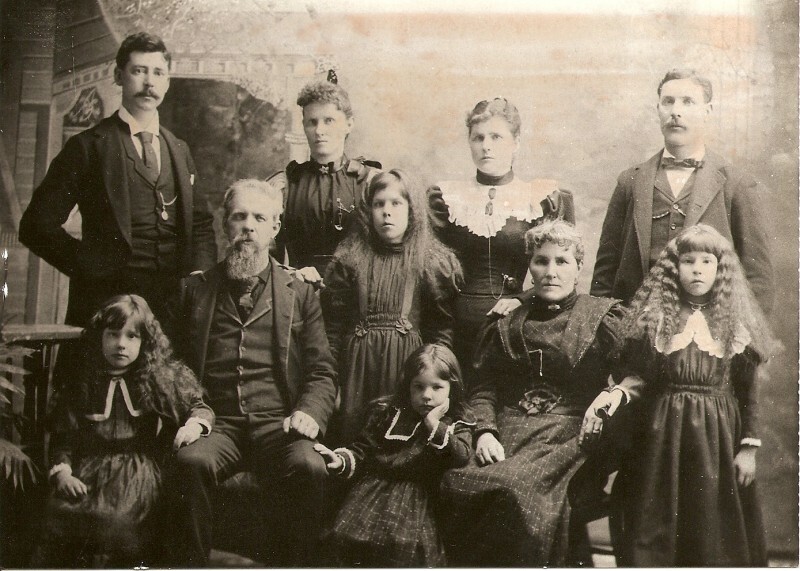 1831 – Born – Herman RATHKE – Herman is my 3rd-great-grandfather on my mother’s side. He was born in Germany and married Fredericke C HENKE. They had 3 children in Germany before immigrating to Wisconsin. Herman passed away on 9 Feb 1898 and is buried at Union Cemetery in Port Washington, Ozaukee Co., Wisconsin. 1632 – Married – Herman van CREIJBECK & Joanna PANSARS – Herman and Joanna are my 10th-great-grandparents on my mother’s side. They were both born in 1610 in Belgium. In 1646, they had a baby boy, Nicolaes van CRAYBECK, my ancestor. Herman passed away in 1649 and Joanna in 1653, which makes me wonder where Nicolaes grew up. 1883 – Married – Carl F H LAST & Augusta Johanna Wilkelumire LUEDTKE – Carl and Augusta are my great-great-grandparents on my mother’s side. They were married in Milwaukee Co., Wisconsin after immigrating with their families from Prussia. Together, Carl and Augusta had a whopping 16 children. Carl passed away in 1926, but Augusta lived to be 100-years-old and passed away in 1963. 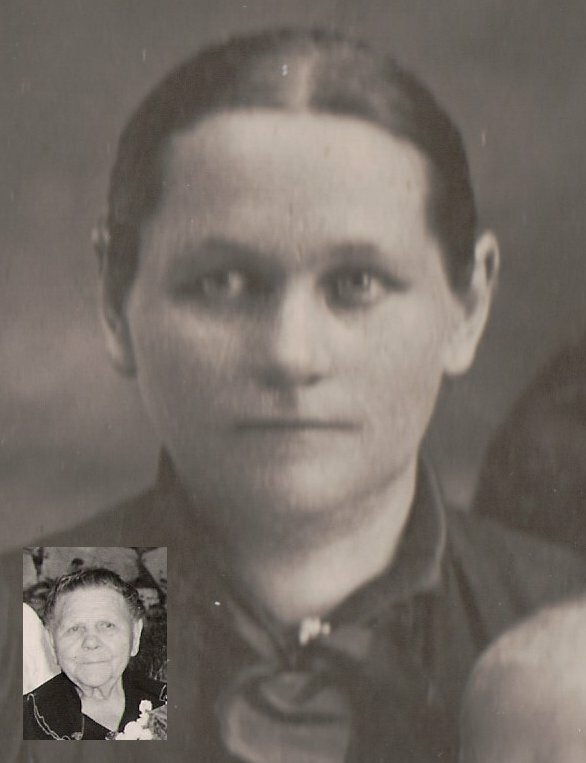 1945 – Died – Marianna ZALEWSKI – Marianna is my great-grandaunt on my father’s side. Her birth location and dates differ depending on the record, though tracking this information could help me track the ZALEWSKI family. The dates I have are: March 1890 in Poland/Germany; 22 Mar 1891 in Baltimore; Maryland, 22 Mar 1891 in Ohio; and 1891 in Wisconsin. Since I do have a record of the ZALEWSKI family arriving in Baltimore in 1889 with no mention of Marianna, I can cancel out the Poland/Germany option. They were first found in Milwaukee in the 1892 city directory, so all of the other options still work. Marianna married Frank GIERSZEWSKI (before changing it to GIERSCH) in 1913 and passed away in 1945 in Milwaukee. She is buried with her husband at Holy Cross Cemetery in Milwaukee.